While this is technically the first week of my training plan for the St. George Marathon, the first scheduled run doesn’t happen until Saturday. However, I’m hoping to get in some good mileage leading up to the weekend. After getting off to a good start last Tuesday & Wednesday, I turned into a lazy bum the remainder of the week. The only real positive is that I got in 4 solid days of cross training activities, including 2 upper body workouts, 2 leg workouts, and 2 abdominal workouts. My goal is to get in 15 to 20 minutes of cross training each day until race week. Now that training has officially begun, there can be no more lazy days off from running or cross training!! My legs were a bit stiff during the first mile, but generally felt good after that. Glad to finally hit my “easy” pace. For cross-training I got in a short abdominal workout last night. Working on finalizing my cross-training schedule for St. George. I met some friends at the main gates of Percy Warner Park at 5:15am for a hilly, 6.5-mile run in the park. Most in the group were running 9-miles, but my plan was to run just past the 3-mile marker, which is a climb of just over 1000 ft., and then head back down the same route. My goal is to get in some downhill running that closely approximates what the St. George descent will be like. 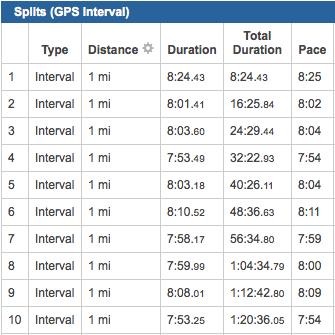 With that in mind, I didn’t worry too much about “easy” pace since anything would be greatly skewed by the elevation change (my overall avg was 9:15 per mile)…. Overall I felt pretty good considering that I had barely over 12-hours between runs. My legs felt better than they had in a long while during the climbs. My friend Marc also only wanted 6-miles, so it was nice to have him accompany me back down. As many times as I’ve run the main drive in PWP, this is the first time I’ve ever done an out-and-back to the top of “3-mile-hill.” Will likely make this a regular part of my St. George training. My intention was to wake up early before worship service this morning and knock out a 6-mile easy paced run. However, I couldn’t get myself out of bed, so that meant I got to do the run this afternoon. Early this morning it was in the low 50s, but when I started at 2pm it was in the 70s with full sun and high humidity. I was already tired from yesterday’s 10-miler, but the addition of the heat and humidity made this a miserable run. This is baffling to me. I wasn’t intently focused of my watch today, but when it would beep at the mile splits I was shocked when I saw that it was too fast. Ever since I came back from the half marathon in Indy, I’ve been inexplicably pushing the pace on most of my runs. Anyway, even though I paid the price for my lack of discipline in getting up early, at least I got the run done today. Also, because I count my “running week” from Monday to Sunday, this was my first 5-day-week since coming back from my latest injury. 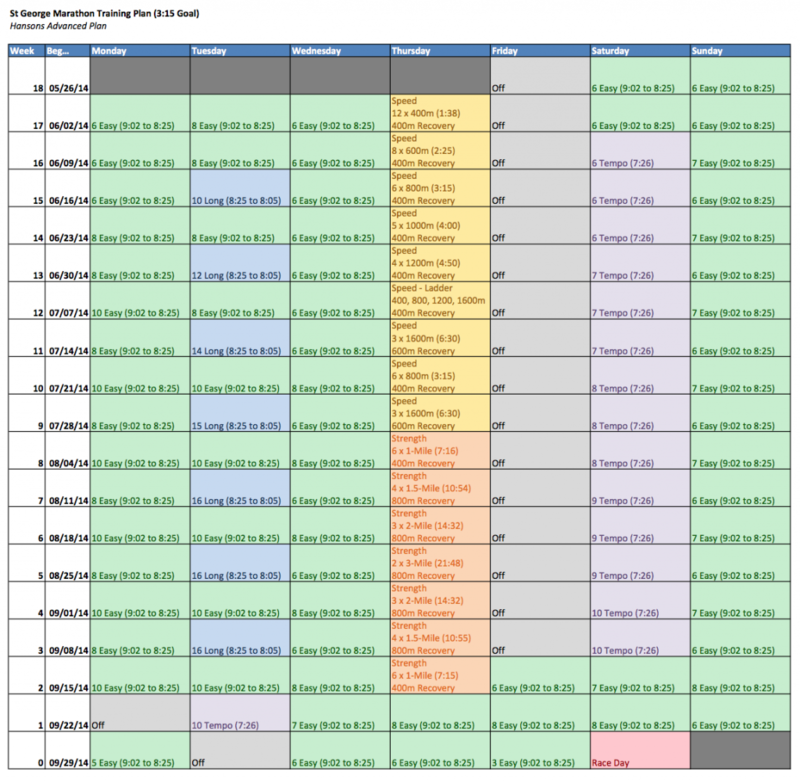 In the lead-up to the beginning of my training schedule for the 2014 St. George Marathon, my goal is to keep building my base to prepare for the higher mileage weeks, and to practice the designated paces from the Hansons Plan for various types of runs. During this week I’ve been practicing “Easy” pace, which is supposed to be between 8:26 and 9:05 per mile. I nailed this on my Monday run, but was waaaay too fast on Wednesday. Yesterday (Friday) morning I met Brian for a 4.5-mile run through the streets of Bellevue and on the Harpeth River Greenway. 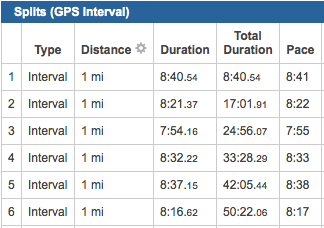 During that run we hit the goal for all 4 of the complete miles…. Today my goal was to get in some practice doing a 10-miler at “Long” run pace, which is supposed to be between 8:05 and 8:25 per mile. I started out with my running group at the Edwin Warner Park Nature Center. They were planning on doing approximately 10-miles on the Harpeth River Greenway, but I wasn’t sure if anyone else would want to run that pace since most are coming off recent marathons. About 30 seconds after starting I realized this would be a solo effort. 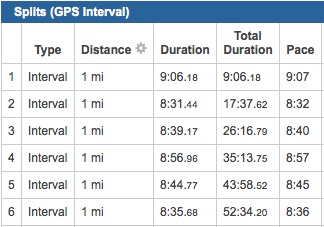 This pace is a lot faster than I’m used to for a long run, but I felt really good for the first 7 or 8 miles. Generally I did a decent job of keeping most of the splits around my goal range, but tended to be a little fast. My last two miles were a bit tough, but I still kept a good pace. I made the mistake of not carrying water, and was very dehydrated by that point. My overall average was 8:04, so just a touch too fast, but not a bad first try. After grabbing some much needed water, I ran an additional 1.2-miles at a much more modest pace as a cool down back to the Nature Center. Feel good about this effort though I know it is only gonna get harder as the Summer temps arrive. I normally don’t run on Sunday, but if I can be disciplined enough to get up early tomorrow I’m hoping to get in another 6-mile easy run before morning worship service. With thunderstorms in the area this morning, I decided to come home from work a bit early and try to squeeze in an easy 6-mile run before midweek Bible study. It was cloudy, windy, and a bit cooler (mid 70s) when I started but the humidity was NASTY. I also knew more heavy rain was on its way so I was hoping to knock out the run before it arrived. I parked my car across from the Old Harding Road driving range, and ran 1.5-miles out-and-back both directions on the Harpeth River Greenway. My legs felt really good from the start, and my pace quickly got a bit too fast. The plan was to try and keep all my splits between 8:26 and 9:05, which is my “Easy Run” range under the Hansons training plan that I intend to start in a couple of weeks. 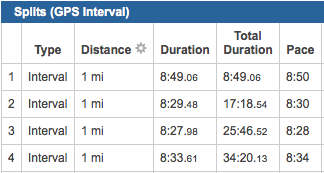 I was good for the first two miles with 9:00 and 8:27, but then mile-3 was 8:07. As I started the second out-and-back I kept telling myself that I needed to slow down. For some reason my body just wanted to go faster today, and all-in-all this run felt fantastic. 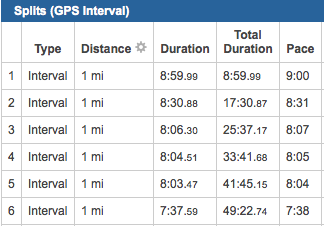 The good thing is that the last mile really didn’t feel much faster than any of the others. So, hoping to get in another easy 6 over the next two days before a 10-miler with the group on Saturday. Trying to build up my base a little over the next two weeks before St George Marathon training officially begins. It’s gonna take a LOT of discipline the make it through this schedule, especially considering I’m having a hard time finding running partners these days. The total weekly mileage peaks in the mid-60s, but the longest single run is only 16-miles (that’s right….NO 20-milers). I shifted the Hansons plan a bit so I could end up with my Speed / Strength workout on Thursday and my tempo runs on Saturday. My plan right now is to do the speed workouts at the Vanderbilt track with the JSRC track group. I won’t be able to do the same workouts as everyone else, but at least it will give me access to a track. When it comes to the strength workouts I plan to do these on local greenways. By far my two biggest concerns are consistently doing 6-days of running each week AND the tempo runs at goal marathon pace. Those are gonna hurt! 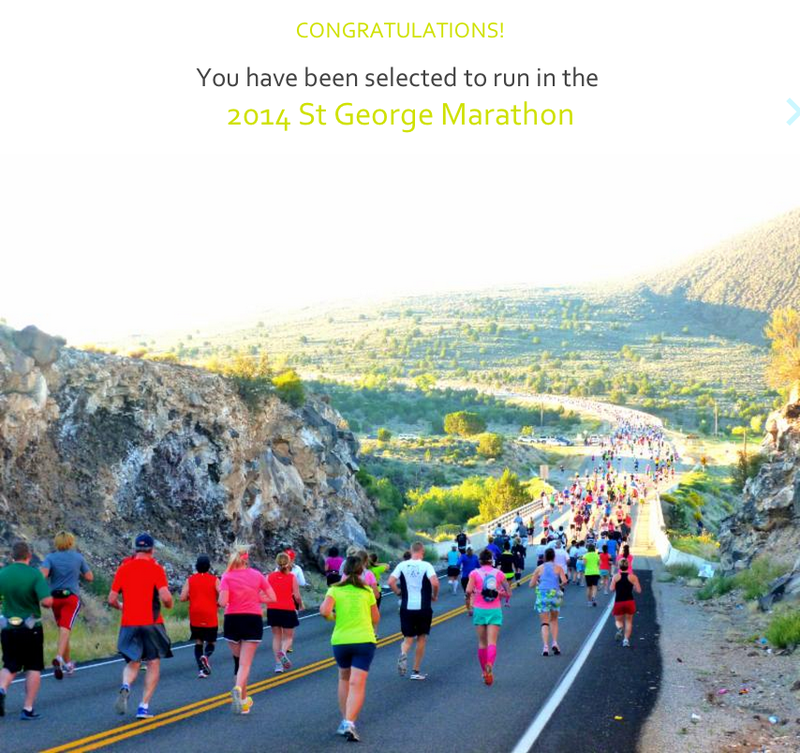 2014 St George Marathon – I’m In!!!! Just found out about an hour ago that I was selected in the lottery for the 2014 St George Marathon! So excited to be participating in this race. Definitely one of my bucket-list marathons and a chance for redemption after dealing with multiple injuries over the past 18+ months. It is also the perfect race to celebrate my 40th Birthday! Can’t wait!!! Now, I’ve got to work-out travel arrangement and my training plan. On training, my goal is simple….3 hours 15 minutes. I’ve broken it once before, but this time it will be for a BQ. Everything I do in training will be aimed squarely at this target. I also know that to get there I have to avoid injury, which has been a problem for the last year and a half. I mentioned in my post yesterday that I hoped to get back on the road today after taking last week off. I got in a solid 6.25-mile easy run on the Harpeth River Greenway. It was pretty warm and humid, but overall my legs felt fantastic. If I decide to go with the Hansons Marathon Training Plan, my easy-run target pace will be between 8:26 and 9:26 per mile. Today I averaged 8:40 pace, which is right in-line. 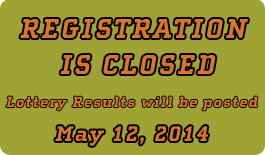 Well…tomorrow is the day I find out whether or not I made it into the 2014 St George Marathon. Feeling a little nervous, because I REALLY want to do this race to celebrate my 40th birthday and return to marathoning. If I don’t get in, then I hope to quickly select an alternate race. Either way I plan on mapping out my training plan ASAP, and am strongly considering doing the Hanson’s Advanced Plan. More on that later if I choose to go this direction, still in the middle of reading the Hansons Marathon Method book. After the 500 Festival Mini Marathon last Saturday, I took an unplanned week off from running this week. Just felt tired and decided to take a week to recover. My plan is to get back on the road tomorrow. I did a new core workout yesterday morning, and my obliques are more sore today than I ever remember before. This is definitely a problem area for me, so hoping this new routine will help out there. Not sure about the quality or quantity of the hay, but whatever I have is in the barn for the 500 Festival Mini Marathon tomorrow in Indianapolis. I was able to get in 2 tune up runs this week. The first was an easy 4-miler on Wednesday through the streets of Bellevue at approximately 9-minute pace. After taking 3 days off I was surprised at how bad my legs felt. I guess this was a lingering result from my miserable 13-miler on Saturday. 1.) I was pretty tired at the end, which is not smart. Didn’t want to trash my legs for the race. 2.) My goal pace is closer to 7:40, but I have no idea if this is attainable. I know I can complete 3-miles at 7:34, but this doesn’t tell me much about how I would have felt at 7:40 pace. 3.) This offered no practice at maintaining 7:40 pace. So, tomorrow I’m just going to run by feel and hope to keep every mile under 8:00. This will guarantee a finish of 1:45 or less. If I push much harder than this, especially early on, I’m afraid I may end up walking. Haven’t done much this week, but did get in a half set of P90X Chest and Back on Monday and X-Stretch last night. After my dreadful 13-miler on Saturday I have no idea what to expect in Indy. I was hoping to better my 1:41 from the Tom King Half in early March, but I’m honestly just going to run according to feel on race day. Even though I didn’t run today, I did get in another half set of P90X Chest and Back. It is humbling how much upper-body strength I’ve lost, but I’m determined to get it back.